A new study details how researchers used data from blazars to measure the evolution of the EBL over the past five billion years for the first time. How much light has been emitted by all galaxies since the cosmos began? After all, every photon (particle of light) from ultraviolet to far infrared wavelengths ever radiated by all galaxies that ever existed throughout cosmic history is still speeding through the Universe today. If we could carefully measure the number and energy (wavelength) of all those photons—not only at the present time, but also back in time—we might learn important secrets about the nature and evolution of the Universe, including how similar or different ancient galaxies were compared to the galaxies we see today. That bath of ancient and young photons suffusing the Universe today is called the extragalactic background light (EBL). An accurate measurement of the EBL is as fundamental to cosmology as measuring the heat radiation left over from the Big Bang (the cosmic microwave background) at radio wavelengths. A new paper, called “Detection of the Cosmic γ-Ray Horizon from Multiwavelength Observations of Blazars,” by Alberto Dominguez and six coauthors, accepted to be published by the Astrophysical Journal—based on observations spanning wavelengths from radio waves to very energetic gamma rays, obtained from several NASA spacecraft and several ground-based telescopes—describes the best measurement yet of the evolution of the EBL over the past 5 billion years. So, astrophysicists developed an ingenious work-around method: measuring the EBL indirectly through measuring the attenuation of—that is, the absorption of—very high energy gamma rays from distant blazars. Blazars are supermassive black holes in the centers of galaxies with brilliant jets directly pointed at us like a flashlight beam. Not all the high-energy gamma rays emitted by a blazar, however, make it all the way across billions of light-years to Earth; some strike a hapless EBL photon along the way. When a high-energy gamma ray photon from a blazar hits a much lower energy EBL photon, both are annihilated and produce two different particles: an electron and its antiparticle, a positron, which fly off into space and are never heard from again. Different energies of the highest-energy gamma rays are waylaid by different energies of EBL photons. Thus, measuring how much gamma rays of different energies are attenuated or weakened from blazars at different distances from Earth indirectly gives a measurement of how many EBL photons of different wavelengths exist along the line of sight from blazar to Earth over those different distances. 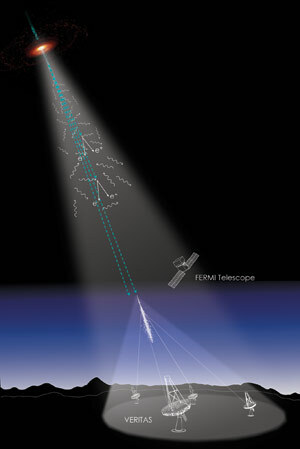 Observations of blazars by NASA’s Fermi Gamma Ray Telescope spacecraft for the first time detected that gamma rays from distant blazars are indeed attenuated more than gamma rays from nearby blazars, a result announced on November 30, 2012, in a paper published in Science, as theoretically predicted. Now, the big news—announced in today’s Astrophysical Journal paper—is that the evolution of the EBL over the past 5 billion years has been measured for the first time. That’s because looking farther out into the Universe corresponds to looking back in time. Thus, the gamma ray attenuation spectrum from farther distant blazars reveals how the EBL looked at earlier eras. This was a multistep process. First, the coauthors compared the Fermi findings to intensity of X-rays from the same blazars measured by X-ray satellites Chandra, Swift, Rossi X-ray Timing Explorer, and XMM/Newton and lower-energy radiation measured by other spacecraft and ground-based observatories. From these measurements, Dominguez et al. were able to calculate the blazars’ original emitted, unattenuated gamma-ray brightnesses at different energies. The coauthors then compared those calculations of unattenuated gamma-ray flux at different energies with direct measurements from special ground-based telescopes of the actual gamma-ray flux received at Earth from those same blazars. When a high-energy gamma ray from a blazar strikes air molecules in the upper regions of Earth’s atmosphere, it produces a cascade of charged subatomic particles. This cascade of particles travels faster than the speed of light in air (which is slower than the speed of light in a vacuum). This causes a visual analogue to a “sonic boom”: bursts of a special light called Čerenkov radiation. This Čerenkov radiation was detected by imaging atmospheric Čerenkov telescopes (IACTs), such as HESS (High Energy Stereoscopic System) in Namibia, MAGIC (Major Atmospheric Gamma Imaging Čerenkov) in the Canary Islands, and VERITAS (Very Energetic Radiation Imaging Telescope Array Systems) in Arizona. Comparing the calculations of the unattenuated gamma rays to actual measurements of the attenuation of gamma rays and X-rays from blazars at different distances allowed Dominquez et al. to quantify the evolution of the EBL—that is, to measure how the EBL changed over time as the Universe aged—out to about 5 billion years ago (corresponding to a redshift of about z = 0.5). “Five billion years ago is the maximum distance we are able to probe with our current technology,” Domínguez said. “Sure, there are blazars farther away, but we are not able to detect them because the high-energy gamma rays they are emitting are too attenuated by EBL when they get to us—so weakened that our instruments are not sensitive enough to detect them.” This measurement is the first statistically significant detection of the so-called “Cosmic Gamma Ray Horizon” as a function of gamma-ray energy. The Cosmic Gamma Ray Horizon is defined as the distance at which roughly one-third (or, more precisely, 1/e – that is, 1/2.718 – where e is the base of the natural logarithms) of the gamma rays of a particular energy have been attenuated. This latest result confirms that the kinds of galaxies observed today are responsible for most of the EBL over all time. Moreover, it sets limits on possible contributions from many galaxies too faint to have been included in the galaxy surveys, or on possible contributions from hypothetical additional sources (such as the decay of hypothetical unknown elementary particles). Be the first to comment on "Evolution of the EBL Over the Past 5 Billion Years Measured for the First Time"